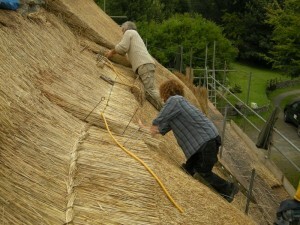 Thatch is one of the oldest types of roof covering. It consists of bundles of plant stems, laid in layers to pitched roofs so that precipitation runs down the stems and is shed clear of the building. The thatch is laid at such a pitch and thickness so that only the outer centimetres ever get wet and the inner layers remain bone dry. The roof is topped by a ridge that protects the apex junction. Thatching is a vernacular tradition, undertaken in the past on a regular basis to maintain domestic and agricultural dwellings, using locally harvested and widely available materials applied by local craftsmen. Thatching has evolved with the transformation of the agricultural industry. The development of harvesting and processing machinery, changes in landscape management, selection of crop varieties to produce certain characteristics (not necessarily advantageous for thatching) and improved transport have affected thatching material supplies and quality. Although the materials may have changed, the methods used remain essentially the same. The standard of thatching has certainly improved and the sector, though disparate, encourages high of standards of craftsmanship. Todays thatchers are the modern representatives of this ancient craft that has survived centuries of technological and economic change – but the survival of distinctive regional thatching traditions will depend on maintaining supplies of top quality thatching materials as well as the passing down of local skills to younger generations of craftspeople.